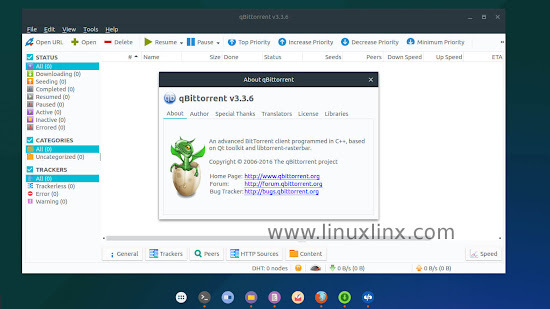 In this post we provide you how to install qBittorrent 3.3.6 on Ubuntu or Linux Mint by adding last stable package of qBittorrent official PPA: ppa:qbittorrent-team/qbittorrent-stable, how to use qBittorrent and how to remove/uninstall qBittorrent 3.3.6 on Ubuntu PC. qBittorrent 3.3.6 which just released on 20 Jul, 20 2016 com with several bugs fixed. - Do not create save folder in advance. - Fix upper-bound limit of command line for "Run External Program" in Windows. - Invoke system's cmd.exe directly. - Workaround space issues in file path for running external program on Windows. - Fix icons are missing when using RTL languages in Options dialog. As we mention above we will install qBittorrent 3.3.6 on Ubuntu by adding last stable package of qBittorrent from their official PPA ppa:qbittorrent-team/qbittorrent-stable. First, open your terminal (ctrl + alt + T), Then use these command to add qBittorrent PPA and install it. Use command 'qbittorrent' (without quote) to open latest installed qBittorrent. - Remove installed qBittorrent and qBittorrent dependencies. - Remove installed qBittorrent and any other dependant packages which are no longer needed. - Then, Remove qBittorrent PPA. These how to install qBittorrent 3.3.6 on Ubuntu by adding last stable package of qBittorrent official PPA: ppa:qbittorrent-team/qbittorrent-stable and how to remove/uninstall qBittorrent on Ubuntu or Linux Mint. For detail info about qBittorrent you can visit their official links which are available under useful links below.